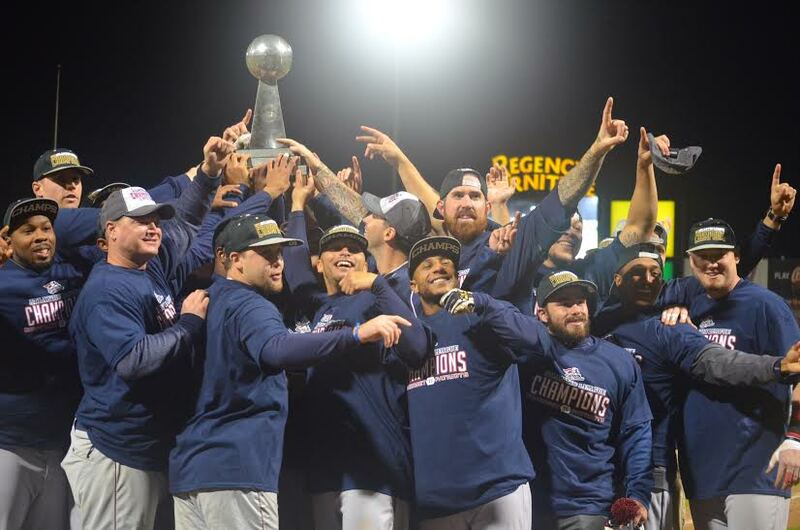 The Somerset Patriots clinched the 2015 Atlantic League Championship by defeating the Southern Maryland Blue Crabs 3-1 in the best-of-five series. The Patriots defeated the Blue Crabs 3-1 in Game Four behind another dominant performance by Playoff MVP Roy Merritt (3-0), who allowed an unearned run with six strikeouts in seven innings of work. “He didn’t have his best stuff, but he did what he had to do to get tough outs. He pounded the zone and his performance speaks for itself,” said catcher Adam Donachie, who won his first professional championship in his fourth season in Somerset. Somerset took a 1-0 lead on a solo home run by designated hitter Thomas Neal (1). “I was just looking to stay in the middle of the field and continue to swing the bat the best I can. He threw a slider and I stayed on it and was fortunate enough to hit-put a good swing on it-and hit it out,” Neal said. The Blue Crabs answered in the bottom of the second after an error by Robert Andino extended the inning and allowed Jamar Walton to score on an RBI single by Fred Lewis that evened up the score at 1-1. The Patriots broke the tie with two runs in the seventh. With the bases loaded, David Vidal scored on a passed ball and Neal once again played the hero with an RBI single to provide the 3-1 final. Merritt was named the Playoff MVP for his 3-0 record, 0.41 ERA and 12 strikeouts in 22 innings pitched. He pitched in two deciding playoff games and won both, including a complete game in Game Five of the Liberty Division Series. “Roy’s our big game guy. He’s a guy that we’ve loved in every situation the last two years, in any critical situation. That’s one thing about the post season. You never know who can handle that load. We know he can. We have a history with him and know we want him out on the mound,” Somerset Patriots manager Brett Jodie said. The 2015 Atlantic League Championship marks the first of Brett Jodie’s career as Somerset Patriots manager. He won one as a player with the team in 2003 and two as pitching coach in 2008 and 2009. The championship is the sixth for the Somerset Patriots, who have previously won in 2001, 2003, 2005, 2008, and 2009. The Somerset Patriots would like to thank their fans for a Championship 2015 Season. For more information about the team, visit www.somersetpatriots.com.Somerset Patriots LHP Roy Merritt (3-0, 0.41 ERA) was named postseason MVP.